I attended Worldcon 76 with my husband and had a wonderful time, as always — this was my fourth Worldcon. It was a five day celebration with more than 5,500 of my best friends. If you’ve never heard of Worldcon, it’s an annual event held in a different place each year that brings together fans of science fiction and fantasy, along with writers, editors, artists, musicians, costumers, scientists, and other creative folk. It’s also where the Hugo Awards are presented. It’s been described as a gathering of family, a network of friends: old, new, and potential friends. And because we are all in one way or another creative — it is an active fandom — we can cross-fertilize with other countries, other genres, and other ideas. Creativity of all sorts is honored. 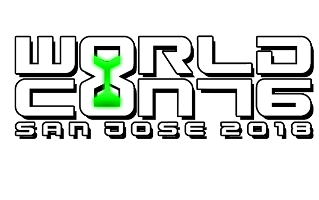 Since each Worldcon is in a different location, a lot of its organization depends on the local committee and the venue. Still, each Worldcon typically features opening and closing ceremonies, an art show, a costume contest called the Masquerade, concerts, music, a dealers’ area selling everything from books and games to jewelry and swords, history and science exhibits, films and videos, and dances. Children have their own programming track. In the evening, parties of all sorts are held, usually in hotel rooms and suites. At any moment, anywhere, you might walk past someone dressed as an elf or stormtrooper. If all this sounds a bit mind-boggling, it is. And the whole thing, from top to bottom, beginning to end, is run by passionate volunteers. Here’s my report about how I had fun at Worldcon 76. A slight haze veiled the hills around Santa Clara Valley as our airplane from Chicago descended into the San Jose Airport. California has a fire problem, and a little smoke and ash had drifted to the area, also known as Silicon Valley. I’d spent the flight reading Rogue Protocol, the third novella in the Murderbot Diaries series by Martha Wells. The first novella in the series, All Systems Red, was up for a Hugo at Worldcon 76, which was already underway at the San Jose Convention Center downtown. My husband and I met some other convention-goers as we took a bus and then light rail to downtown. We checked into our hotel, the Fairmont; I convinced it not to charge me $13.95 a day for internet connection (the swimming pool is free, but not the internet?). We went to the Convention Center two blocks away and waited an hour in line to get our credentials. By then opening ceremonies were about to start, but I went to the Publications Office because I had volunteered to help with the convention newsletter, The Tower. I did some proofreading, then left with a stack for distribution. That job took me to the Exhibition Hall containing the art show, dealers, gamers, and more. It was an impressive space. Then I met up with my husband, and we wandered back to our hotel for parties, and a couple of hours later, suddenly it was time to go to bed. The next morning I attended the Science Fiction and Fantasy Writers of America meeting, hoping to get some breakfast there, but by the time I arrived at 8:05 a.m., five minutes after it opened, all that was left was oatmeal, yummy oatmeal. I learned that SFWA was having a good year full of activities. At 10 a.m., I was assigned an hour in the autographs area in the Exhibition Hall and met some fans and signed some books. I was awed to meet them. They liked my book enough to seek me out! At noon, at a panel, some authors who were part of the Mexicanx Initiative read their works in Spanish. Artist Guest of Honor John Picacio had organized a fundraising drive to sponsor 50 authors, artists, filmmakers, and fans from Mexico to attend the convention. I came to the reading to enjoy the music of the language of Cervantes, and I found an author I want to read more of. Next I heard Jo Walton read from her next book, Lent, which apparently contains lots of scary demons and sounded worth reading. Then I checked in at the newsletter office and was assigned to distribute more newsletters. I attended some panels, and at 5 p.m. moderated “Exploring a Wider Universe: Beyond the World of Anglophone SF/F.” We had panelists from China, Saudi Arabia, Israel, Mexico, and Spain (me). It ended with a story by the Saudi publisher about how he and his author battled censors over the fantasy/magic content of a book. I attended another panel, got some food at the Art Show opening, and looked at all the exhibits (lots of cats and kittens in the art), then attended room parties at the Fairmont Hotel. Many of the parties were a bit overcrowded. I think that might be because the Fairmont lobby bar had a band playing with its speakers set to 11. Talking was impossible, and we had all come to meet and talk, so we had no alternative social space besides the parties. I helped proofread and distribute the morning edition of the newsletter, then went to panels. A couple of times, the ones I hoped to attend were full, which was how I found myself in “The Magic of Plotting” presented by Kay Kenyon , which I hadn’t meant to attend, but her ideas helped me enormously with the novel I’m trying to write now. That afternoon, a group of self-described “patriots” held a rally in front of the convention to protest … something, I’m not sure what, and some of the groups that promised to participate had a worrisome history of violence. So when the rally was underway, I went to a window to see what was happening. “Just a dozen guys are out there,” a man who’d been watching for a while told me, “and I think some of them might actually be waiting for the bus.” We had worried over nothing. Because I’m bilingual, I was chosen to moderate “Beyond the Border II: Borders, Crossings, and the Lands Beyond.” This was a Spanish-language discussion about the future of Mexican SF. I had little to do besides open the discussion and direct things now and then. The panel had a lot to say, especially about subverting Mexican publishers’ narrow expectations. At another panel, “Houston, We Have a Problem,” I saw astronaut Kjell Lindgren and other people in the space program describe how they plan for problems. “Failure is not an option, it’s a necessity,” Lindgren said. Things will go wrong, so they rehearse solutions to all kinds of trouble before the mission begins. Next I took part in the Broad Universe Rapid-Fire Reading, and I read a little essay about describing how if I were a plant, I would rule the Earth. Broad Universe is an organization that promotes the work of women writers, and often at conventions it hosts a reading featuring a series of authors, in this case 15. Most of us read from one of our books, but I read about a theme related to my book. It was meant to be funny, and people laughed, so I think it worked. That evening, my agent hosted a dinner for her clients and their guests. She tries to get us to know each other, so it was a dinner of friends. After that, my husband and I toured a few parties. After a satisfying breakfast of bagels and lox in the Con Suite, where the convention offers free food, I helped with proofreading and delivery of the morning newsletter, then participated in the Science Fiction and Fantasy Association poetry reading, celebrating the association’s 40th anniversary. Then I attended other panels. At “Why Do Writers Kill Characters?” Ada Palmer said a wise thing: It’s not the death of a character that affects the readers, it’s the mourning for that character in the story. My literary agency sponsored an afternoon reception at a local brewpub — San Jose has lots of them — so I went, and we all did our best to help spend the budget. The beer was good, and the company delightful. Then everyone got ready for the Hugo Awards. The line to get into the Grand Ballroom was long, but my husband and I headed for the Callahan’s Place bar area of the Exhibition Hall, where the ceremony would be livecast and food and drinks were available. A lot of people had that idea, so chairs from other parts of the hall were commandeered. The ceremony went well, but halfway through I left to go to the newsletter office. There, behind a locked door, the team was preparing a special Hugo edition listing the winners. I helped with proofreading — and I checked, All Systems Red (Murderbot) had won the novella category. In the other categories, I was satisfied by the winners, but it had been a strong ballot, so my satisfaction was guaranteed. The newsletter was printed, and I was dispatched with copies to distribute when the ceremony was over. As I waited in the Grand Ballroom, papers clutched tight against wandering eyes, I saw Martha Wells try not to cry as she said thank you, and N.K. Jemisin describe how hard she had labored to bring her writing to the world. I handed out newsletters as people left the auditorium, and they seemed glad to receive them. When those had been distributed, my husband and I had intended to go to a dance, but it was cancelled, so we went instead to parties at the hotel. The Brony Boys (male fans of the My Little Pony television series) turned out to be young men who were fired up by the idea that the world would be a nicer place if we would all just be kind to one another. Hard to argue with that. At another party, I said I had a sore throat, and a San Jose local said that might be due to the smoke in the air. Alas, it was not due to smoke, and I woke up with the start of a “con crud” cold the next morning. The newsletter office wasn’t open, so after more bagels and lox in the Con Suite, I had time for one panel before leaving, “Computer History” by Christopher J. Garcia. I was more interested in seeing Chris Garcia than I was in computer history. He’s a curator at the Computer History Museum and has a famously exuberant personality. His talk was an entertaining hour, at times a little technical, but I understood why some of the jokes were funny. Then it was time to go to the airport. On the plane, I read a book I got at a freebie table at the convention, Yaqteenya, by Yassar Bahjatt, Saudi Arabian science fiction and an interesting tale of alternate history. I had lots of time for reading. A storm delayed our arrival by five hours. Eventually we landed in sodden Chicago, and at 2 a.m. I was in bed. It had been a five-day celebration with more than five thousand best friends. It was intense. And fun. Next year: Dublin, Ireland.